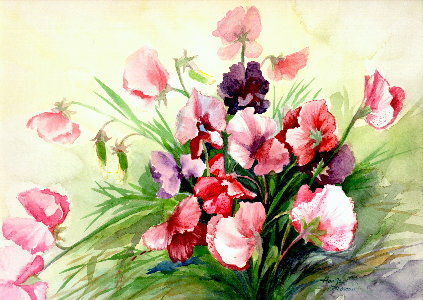 By eliminating all overhead and selling these paintings over the internet, UNMATTED and UNFRAMED, Hae Ja is able to offer to you any painting in the Floral Rooms and the Landscape Room of her cyberspace gallery at a tremendous savings over what you would expect to pay in a commercial art gallery. Please EMAIL US regarding the availability and price for any painting displayed in the gallery! You save by arranging the framing yourself! That way you choose just the right frame and matting to suit your decor.